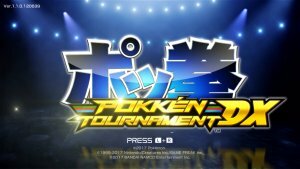 Like most games in the current era, Pokkén Tournament DX is capable of a variety of patches and updates to the software. These updates provide anything from fixes, to balance updates to anything.. This is done automatically if you have the Wii U set to do so, but will also be triggered when you go through and load the game. All Battle Pokémon Double Jump Fixed an issue where players couldn't double jump diagonally after certain actions in Field Phase. Fixed an issue where players couldn't double jump while affected by a positive status increasing their number of jumps. Lucario Forward Weak Attack Fixed an issue that allowed Lucario to move during a Burst Attack's animation when hit by a Burst Attack with specific timing. Machamp Burst Attack Fixed an issue that allowed opponents to move during its Burst Attack's animation. Suicine Aurora Beam Fixed an issue where an Aurora Beam to the left or right couldn't be used from a canceled Ranged Attack. Chandelure Overheat Fixed an issue where Chandelure did not turn black when affected by a negative status when its action was interrupted by an opponent's attack. Garchomp Dragon Claw (Field Phase) Fixed an issue where players couldn't transition to Running Stance when canceling a Ranged Attack into this move. Decidueye Razor Leaf to Soaring Stance to dash step Fixed an issue where players could double jump even if they were not affected by a positive status increasing Decidueye's number of jumps. Jump Attack Allows for trajectory change with D-Pad. High Stance Strong Attack Reduces distance required to move. Backward Strong Attack Increases hitstun to guarded opponents. Slide ~ Jump (Duel Phase) Movement distance altered. High Stance Strong Attack Increases hitstun to opponent. Combo damage harder to increase. Slide ~ Jump Fixed a problem where Empoleon couldn't move if attacked at a certain point. Slide ~ Weak Attack (Duel Phase) Fixed a problem with activation after Phase Change to Duel Phase. Backward Attack ~ Slide(Duel Phase) Fixed a problem with the camera during a Phase Shift. Soar ~ Dash Step Decreases stun time on landing. High Stance Strong Attack Increases hitstun on guarded opponents. Forward Strong Attack (2nd hit) Reduces stun time on activation. Reduces hitstun to opponent. Counter Attack Reduces time to block opponent's attack. Strong Attack Reduces base damage. Jumping Ranged Attack Can now change trajectory. Forward Weak Attack Can increase time for input with a long forward press. High Stance Increases amount added to Synergy Gauge. Shield from Pokémon Moves Reduces time for positive status. Iron Head Harder to attack low stance Pokémon. King's Shield Reduces time Aegislash is invincible after successful block. Backward Weak Attack Cannot be used in midair. Backward Strong Attack (Enhanced) Reduces time of positive status when activated. Water Gun ~ Aura Sphere New Move added. Follow Me Removed invincible time after activation. Splash Increases time required to fill Support Gauge. Oblivion Wing Fixed an issue where opponent's SynergyGuage doesn't decrease. Fire Fang Decreases time to activate. Dragon Ascent Increases base damage. Decreases consumption of Synergy Gauge. Time Travel Decreases time to activate. Backward Strong Attack Increases damage. Backward Weak Attack Increases duration of the attack. High Stance Strong Attack Changes trajectory of the long range move. Acrobatics Fixes an issue where Decidueye may turn after attack. Dragon Ascent Fixed a problem where number of hits varies depending on your character.